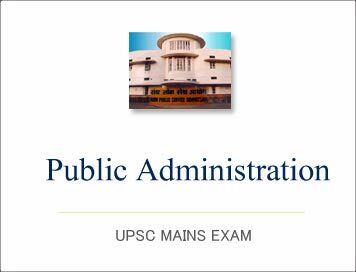 (Download) UPSC Mains 2014 Exam Papers: Public Administration Paper- 1 | IAS EXAM PORTAL - India's Largest Community for UPSC Exam Aspirants. (a) What are the implications of the post-structuralism perspective on the discrete aspects of Public Administrations, coming from its epistemological positions? (b) “Adaptive, problem-solving, temporary systems of diverse specialists, linked together by coordinating executives in an organic flux – this is the original form that will gradually replace bureaucracy.” Discuss, in the light of this statement, the ‘end of bureaucracy’ thesis and its strengths and limitations. (c) “Karl Marx’s interpretation of bureaucracy was rooted in the history of the nature of the State.” Evaluate. (d) “The conceptual division between administrative and constitutional law is quite porous, and that along many dimensions, administrative law can be considered more constitutional in character than the constitutions.” How would you justify the statement? (e) Is Peter Drucker justified in saying, “Management principles should not tell us what to do, but only tell us what not to do”? Comment. (a) Critically examine the Riggsian concept of differentiation in the context of post-globalization era. (b) “The term Development Administration can be used only in a broad sense to mark the variety of approaches and points of view.” Discuss. (c) “The bottom line for governance is outcomes rather than the outputs of government.” Analyze in the context of e-government and e-governance. (d) “Policies determine politics as governments constrain.” Attempt a critique of this statement. (e) “Instead of reforms to budgetary process, Wildavsky process to redefine the role of political institutional and rules by which politics leads to agreement on budget.” Explain.